I was very tentative. I didn’t know what to expect. Was it going to be puckering-ly sour? Was it going to be slimey and infected? 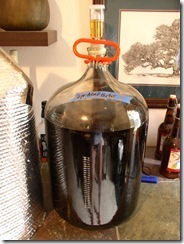 Was it going to be oxidized because the airlock was empty (it was a 3-piece)? I fully expected it to be nasty…and possibly give me some life threatening infection. Well, obviously I’m alive this morning. And, guess what? It tasted fine! Slight taste of coffee, with no residual sweetness. I didn’t taste anything, “off” at all. It is pretty dry, it fermented all the way down to 1008 (from 1056)…so, its ABV should be 6.3%…high-ish for a porter, but not excessive. It is high enough to taste. The most noticeable difference was the TOTAL lack of any carbonation. Even young beers still in the fermenter have a slight fizz on the tongue, and that touch of carbonic acid bite. This has had more than enough time to completely degas, and it is tap-water flat. That was the biggest thing that struck me. I’ve been brewing for 10 years, I’m used to (and prefer) lower carb levels, and have tasted many, many brews out of the primary/secondary. Nothing is ever 100% flat. Anyway, so I thought I still had 5-6 weeks before my current batch would be a drinkable beer (2-3 secondary, 2-3 bottled). But, now I have something clearly ready to bottle TODAY! I’m not saying its the greatest beer in the world, I’m sure a judge somewhere would be able to taste all kinds of defects. My pallet isn’t that trained. But, it tastes “fine”. So, if any story says RDWHAHB…I figured this one does. 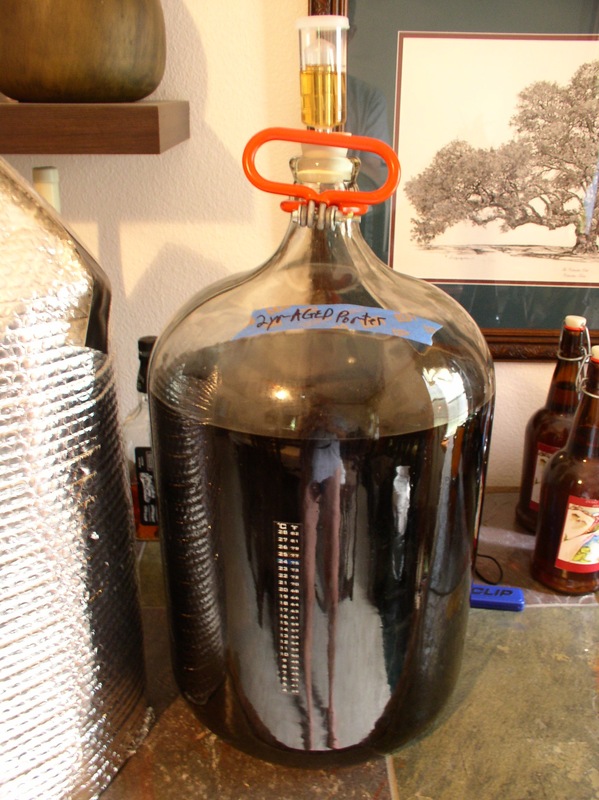 2 years in a carboy with an empty airlock…and, still drinkable. I supposed if it had still been in the primary, I wouldn’t be writing the same story. The biggest thing now, is to decide how to carbonate this sucker. I keg, so I could just force carbonate. But, I also want to bottle some of it (no beer gun), and I’ve always preferred to naturally carbonate and just use gas for serving pressure. Corn sugar is cheaper than gas, and I think there is a mouth-feel difference between forced and natural (but, I’ve never done a side-by-side). I’ve never re-pitched into the bottle. Since I just made another porter, I do have some yeast from that primary. Should I grow a small starter from that, decant, and pitch that with some corn sugar? How big of a starter? I’m sure I don’t want as full primary sized starter. Maybe a 250ml single step?